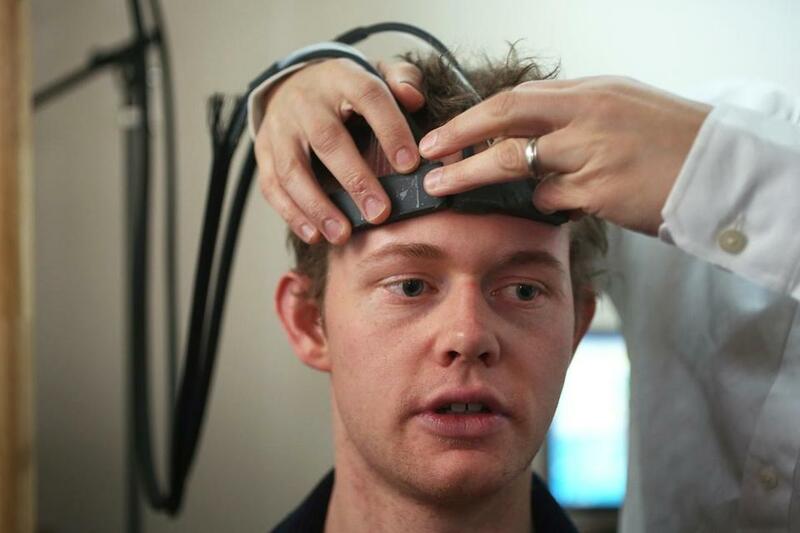 Tufts University student Sam Hincks is fitted with a headband that transmits light through the forehead and reads brain activity. With hundreds of lives riding on every decision, the job of air traffic controller ranks near the top of almost any list of the world’s most stressful jobs. The stakes are so high that the Federal Aviation Administration has increased staffing and rest requirements in recent years to help keep controllers alert in the tower. But imagine if a computer could know the precise moment an air traffic controller approaches mental overload, and reassign some of his responsibilities to a fresher colleague. Technology in development at Tufts University’s Human-Computer Interaction Lab could do just that. Computer scientist Robert Jacob and biomedical engineer Sergio Fantini are working on a headband to read brain activity, enabling a computer to determine whether the wearer is bored, fatigued, or sharp. In a tower full of air traffic controllers wearing headbands, the computer could automatically shift flight assignments, depending on which controllers show higher levels of mental acuity. The possibilities for the brain scanner are not limited to air travel. The researchers and their students also have used the device to generate movie recommendations for wearers, based on how their brains respond to other films. In another experiment, pianists practiced on an electronic keyboard while wearing the headband. As their brain signals indicated mastery of a melody, a computer added complexity to the songs by playing harmonies. For now, the headband prototype is a bit clunky; it connects to a desktop computer through two fat cables. Eventually, Jacob and Fantini envision integrating the brain scanner with a wearable computer, such as Google Glass. They see the technology as part of a future in which humans communicate with computers through thoughts instead of mouse clicks. A Tufts student viewed a computer simulation of air traffic control operations while wearing a brain-scanning headband. The technique for analyzing and acting upon brain activity is called functional near infrared spectroscopy, or fNIRS. A row of small red lights embedded in the headband beams light waves through the skull and onto the prefrontal cortex of the brain. A computer connected to the headband cannot literally read the wearer’s mind, but it can gauge the person’s level of mental exertion by measuring the amount of light absorbed by the brain. A heavily taxed brain draws more blood than one working easily, and therefore absorbs more light. That tells the computer the wearer may be overwhelmed. Every brain is different, so base line testing of each individual is required to determine the point at which performance begins to suffer. In a private demonstration last week, Sam Hincks, a graduate student at Tufts, wore the headband while playing with a computer simulation of an air traffic control operation. 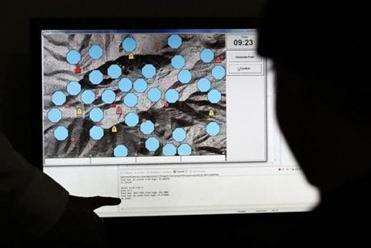 The simulation required him to safely navigate screen icons that represented airplanes through a field of obstacles to their targets without crashing. At any one point, Hincks had four to seven planes under his command, with the headband scanner and computer determining how many he could handle by reading his brain signals. In more extensive tests conducted by the Tufts professors, headband wearers increased their ability to safely navigate planes by an average of 35 percent when the computer adjusted their workload based on their brain activity, instead of at random. Unlike some other means of monitoring brain activity, fNIRS does not require the user to wear electrodes or apply adhesive gel, an advantage the Tufts scientists hope will encourage broad adoption. The headband could, however, be used in conjunction with electrodes to not only read brain activity but also to stimulate it. For example, the Air Force Research Laboratory at Wright-Patterson Air Force Base in Ohio has been experimenting with electrical stimulation to improve soldiers’ mental acuity. Jacob and Fantini’s research is unrelated, but they said the headband could be modified to include a stimulator. In its current form, the headband causes no pain and needs only low levels of light to be effective. Wearing it is not like exposing the brain to a prolonged CT scan, which could be dangerous. “The level of light we’re sending is comparable to the level of light your brain would be exposed to on a sunny day,” Fantini said. The headband has been tested only in the lab, and its creators — though they can imagine several commercial applications — have no concrete plans to bring it to market. If a business approached them about licensing the technology, they would listen, but Jacob and Fantini said they are not interested in launching a startup of their own. can be reached at callum.borchers@globe.com. Follow him on Twitter @callumborchers.